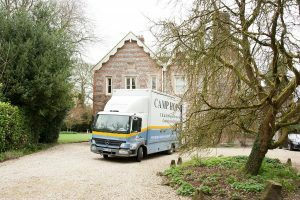 We’ve been doing removals in Royal Wootton Bassett for seven decades so, as you can imagine, we know the area inside out. We know moving inside out, too. There’s something about having been going for nearly a century that gives us an edge that cannot be acquired any other way. Over all that time, we’ve seen every conceivable moving problem and, as you’d expect, we’ve worked out every solution to match. We use a streamlined process that means zero stress for you, especially if you choose our packing/unpacking service; it makes it all so easy. Our packers are thoughtful and fully-trained. They know exactly what kind of packing materials are needed, especially when it comes to difficult and challenging items like precious artworks and large pianos. Our handlers are as conscientious as they come – when they carry your boxes and packages out of your old home, they’ll take extra care so that nothing gets knocked about. Your paintwork, banisters and carpets will be undamaged. This is not the kind of care and forethought you can always expect from removal companies in Royal Wootton Bassett. The process begins when you contact us and we arrange for our estimator to visit you, go over all the details and then draw up an accurate and clear quotation. We’re a BAR-trained (British Association of Removers) organisation so right from the start we hold ourselves to high standards that can’t always be expected from other companies. We don’t see why anyone’s house move has to be tiring and traumatising. We see it as a time of new beginnings, jubilation and optimism and we’ll help you see it that way too. If you need storage in Royal Wootton Bassett, something that wasn’t always plentiful, then our facilities will come in very useful. We put all your possessions into categories and provide you with a flawless inventory. Whether you need a lot of space or just room for a few random things, we can help. Get in touch today and we’ll start working out how to give you a move that revolutionises the way you see moving.